For my birthday, I went to BOA Steakhouse in Santa Monica with my family. There is also one in West Hollywood and Vegas too. BOA is a hotspot in Los Angeles- you constantly see celebrities dining at BOA in West Hollywood almost every night. It’s upscale-chic & trendy and the food is great. I chose to go to the one in Santa Monica because it’s right across the street from the ocean, and it’s less of a Hollywood scene. We sat outside on the patio during sunset and it was a beautiful warm summer night. It was perfect. I love a great steakhouse- I’m a huge Mastro’s Steakhouse fan, but I did hear a lot about BOA so I decided to try it out. We ordered three of these off the menu to split for the five of us which was a perfect serving. This was the best ceaser salad I think I’ve ever had. A guy made the dressing from scratch right next to our table. He asked if we wanted everything in it such as the garlic and anchovies, etc. We told him to put it all. It was creamy, and had a little spicy “peppery” kick to it. It was the perfect ceaser salad. Highly recommended. This was almost like a flatbread mini pizza. Fresh yellow and red tomatoes, onions, mushrooms and melted cheese. It tasted like there was olive oil and garlic too. Great flavor, very tasty. It was a small portion though- more of an appetizer for two people. The melted cheese mixed in with the tomatoes, onions and garlic was amazing. The bread was fresh and warm too. Overall, a good starter dish. At BOA, you have five “rubs & crusts” to choose from, and six sauces you can choose for your steak. For example, for rubs or crusts you can get peppercorn, blackened, blue cheese, herb or foie gras butter. For sauces: creamy horseradish, peppercorn, signature sauce, cabernet, bernaise, etc. For our steaks, we all got it blackened with an herb butter on the side. The ribeyes were decent, but lacking a little flavor to me. Mastro’s and Ruth’s Chris steak has so much flavor, and compared to those steaks, BOA’s steak didn’t have as much. A good steak shouldn’t need sauce and all the extra stuff, but I almost wish I got an extra spiced rub to make up for the lack of flavor. It was still good- perfectly cooked and tender, but it looked better than it tasted unfortunately. My dad ordered this steak. We all had never had a bone in FILET before, so he wanted to try it. He got it blackened/charred and absolutely LOVED it. My dad rarely gets excited over anything- especially food, but he said this steak was very very good. I had a piece of his and it was. It had more flavor than the ribeye. Perfectly cooked and tender also. He was really happy with his choice and kept saying how much he enjoyed it after we finished dinner. This was delicious. I loved it. It had parmesean cheese on top and a buttery lime sauce with a little bit of a spicy kick. Very popular side dish at BOA, and it was recommended by the waiter and a couple of my friends to order it. Well suggested. Highly recommend! 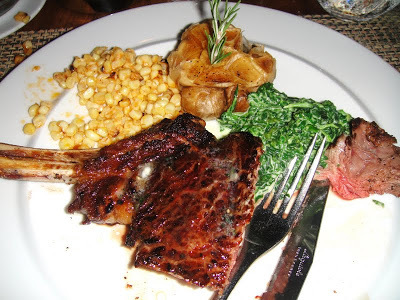 Creamed spinach is my favorite side dish to order at a steakhouse along with my steak. I LOVE creamed spinach. This one was great. It had good flavor. Not as good at Mastro’s, but I still enjoyed it. Can’t really go wrong with creamed spinach! Now this was interesting lol. The truffle cheese sauce had a nacho cheese consistency which I’ve never had before. It was like nacho cheese truffle fries lol. It was yummy. Especially right when they came to our table and the cheese was melted and hot. After sitting there for awhile throughout our dinner, the cheese started to get cold and it wasn’t as good lol. But nonetheless, still a great side choice to go along with dinner. The truffle cheese sauce was so good but then again anything with truffle flavor is amazing. Great portion size to share with five people too- it was big. Two warm chocolate brownies with toasted half-melted marshmellow puffs on top. Side of dolce ice cream with graham cracker crumbles beneath. Drizzled with a caramel/chocolate glaze. If you are a sweets person, you’ll love this! By this time, I was so full I could barely take a couple bites of it. But I do remember it being rich and delish! Overall, we all had a really great dinner at BOA. Everything was good including the service. It was the perfect choice for a delicious birthday dinner right across from the beach. The restaurant itself is beautiful inside, but it’s nice to sit on the patio in Santa Monica, especially when it’s warm outside. I definitely want to go back and try the lunch menu there too, seems like they have a great burger and sandwiches too. If you’ve been to BOA, I’m curious to know what you think about their steaks. What is your favorite steakhouse? Let me know!